Obviously experience teaches. Do something often enough and the chances are good you will get better at it. The ‘urge’ to stay with a particular discipline day after day is not always easy, and in fact can be maddening, but in the end no teacher is required to assure that progress has been made. Practice may not always make perfect, but it definitely does develop ease and facility. This is especially true in the arts, where repetition, rehearsal, draft and concentration lead in the end to a work of satisfaction. In a creative writing journal designed for exactly for this purpose, Allegra Newman and Peter Trauth have given young, or even published writers a format to inspire short imaginative pieces on a multitude of topics. 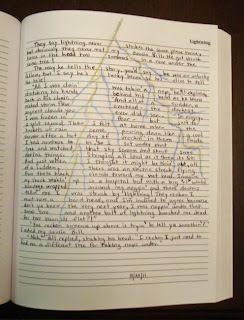 Ms Newman and Mr Trauth published this past July a writer’s exercise journal called 365 Things to Write About! a get-started tool geared to the young or stymied writer’s needs. With a list of 365 one or two-word clues, a blank journal and sharp pencil, most will have all that is required to write descriptions, stories, poems, or simply a page of journal-like thoughts or feelings. The idea is to free the mind from hemming and hawing about ‘What can I write about?’ and set the writing-on-whatever in motion. Getting started is all by itself a huge leap forward and this format puts it all in your head and hand. 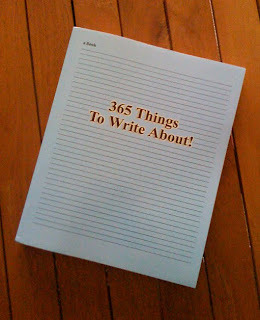 365 Things to Write About! is basically a thick, lined notebook of blank pages with a top corner word clue about either an object, place, concept, action, food, person, instrument, room…well, you get the picture, and that mental picture is all you get to set your pencil moving. With that one word and image in your head, forgetting all but the flow of thought that image unleashes, the chances are excellent that within fifteen minutes your page will be full. The beauty of this type of exercise is in the confidence it builds on a daily basis. For some, day one may be grueling, day two only slightly easier and day three still a struggle. Little by little the process is going to get faster, less encumbered and more fluid—stick with the program and that’s a guarantee. It is to the credit of developers Newman and Trauth that they hit upon this method and laid it out in such simplicity without a camouflage of essays, guidelines, recommendations and theories. Here’s an idea—a hat—now write about that. Straight to the point. I only wish this exercise book had been in my toolbox for the numbers of Japanese students who once daily moaned to me about their inability to fill one page in their journals. In those teaching days I could have made great use of 365 Thing to Write About! No question the students would have found some needed stimulus. The simplicity of the idea and its get-started-now basis is without question, a system that inspires belief because it is a proven method. The developers have presented the plan in a no-frills format, that for all its stripped down efficiency does call out for a spot of color or visual enhancement. Being little more than a hefty, blank, black and white notebook with word hints printed at the top of pages, some might balk at the price. The book’s allure could be improved by a dash of color, and in one opinion at least, a binding that allows the pages to open flat. 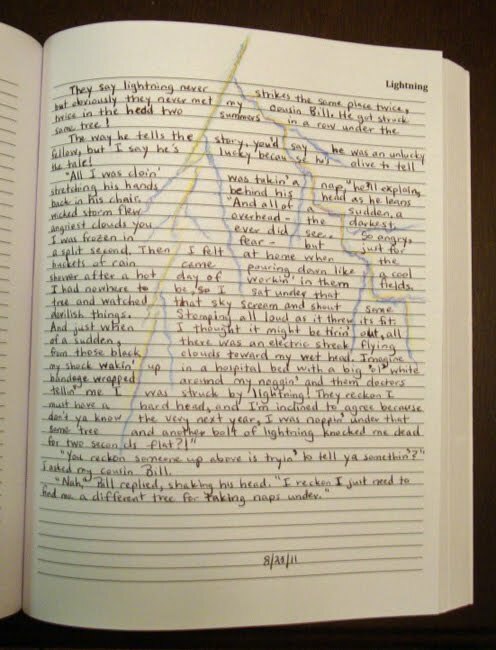 The meagre word clues are just right, still there is the feeling that the notebook-journal could have included graphic content to brighten the experience—a drawing of raindrops and a splash or two, a jumble of hats, a mound of fallen leaves. The plain blue cover reproducing a lined notebook page is less appealing than it could be, and the hope is that interested browsers won’t judge this notebook by its cover. My appreciation to Allegra Newman for asking my opinion and sending a copy of 365 Things to Write About! The overall positive feeling about this exercise-journal is bolstered by Ms Newman’s and Mr Trauth’s agreement to donate one hundred percent of their royalties from sales between August 1 and October 31 to the Los Angeles Fund for Public Education. The book is currently available at Amazon and Barnes & Noble. Meanwhile, take a look at what some writers have done with 365 Things. You did a great job with something that you weren't originally thrilled with. After I saw it and thought about it some more, I grew to like the idea. I do agree, though, that it's kind of plain looking. Also, I agree that it would be nice if it laid flat when opened for easier writing. I do like the thought process, though. I think it could be a very good workbook for a budding writer.